Lenormand card spreads can range from the simple to the complex. 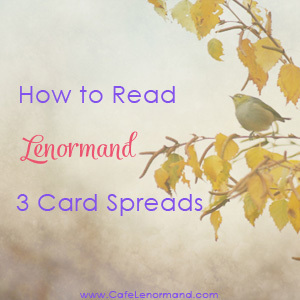 The Lenormand 3 card spread is an easy, fast spread that quickly answers your question while providing a lot of information. It is a short, linear spread, read from left to right. The central card carries the most weight, providing a focus for the spread. Often it provides the main answer with the other cards filling in the details. The Lenormand 3 card spread can be used to give you an immediate insight into a situation or as a prediction for the short-term future. This is a card spread that provides a shorter time-frame and less information than the Grand Tableau, but is still extremely helpful. 1. Shuffle the cards while concentrating on the issue and the question. 2. Cut the deck and place the bottom half on top of the top half. 4. The central card in the spread (card 2) is the focus card. It gives an overall meaning or theme for the spread. 5. Cards 1 and 3 are read individually. 6. All 3 cards are read together as a whole to form a general story. 7. Cards 1 and 3 are read together to give additional insights. This is known as mirroring. This 3 card spread is from a reading I did for a friend. The Lenormand Ship is the central card in the spread. It carries extra weight and highlights why G hasn't met her soulmate. The Ship represents trips, distance, travel, and foreigners. This tells me that the central reason G hasn't met her soulmate is because travel and/or distance are involved. It could mean they don't live in the same town or one of them needs to either move or take a trip to where the other lives. Looking at the first card, we have the Lenormand Book. The Book represents hidden information and discoveries. It confirms to me that G hasn't met her soulmate. He isn't someone in her current network. He is unknown to her. Getting the Lenormand Birds in the spread emphasizes the concept of meetings and couples, and assures me that the cards are addressing the question asked. It also points to G meeting her soulmate in the future. Book + Ship indicates intentionally evading something – perhaps G doesn't feel ready for a relationship or has been putting it off to focus on other things. It also suggests that she will need to get out more to meet him. She may not know where to go (Book), but it isn't near her home (Ship). Reading Cards 2 and 3 together: Ship + Birds indicates that if she does this, she will meet him. We also have some more insight into the travel she might need to do as Ship + Birds often represents plane travel. This combination can also refer to foreign languages and foreigners, confirming that her soulmate is not near where she lives. It doesn't mean she needs to travel to another country to meet him – he could be a foreigner living in her country. However, she definitely needs to get out of her zip code. It doesn't look like she'll be finding him at her local coffee ship. Mirroring the Book and Birds reveals information will come to help her. It might involve training or working with the public or media. Overall, it looks like she may need to travel either for training or public/media work to meet him. When I informed G what the Lenormand 3 card spread revealed, she confirmed that she hadn't been getting out much lately. She has been spending all of her time either working or relandscaping her yard. She also mentioned that through her work she may have an opportunity to travel (by plane) to an event that would involve training on marketing to the public. She won't know if she'll go for a couple of months and was thinking of not going, but might reconsider now. Isn't it amazing how much information you can get from 3 cards when you know how to read a Lenormand spread? Hello. thanks for sharing the 3 card reading info. I asked the same question” why haven’t I met my soulmate?” And the following cards were drawn after I shuffled while concentrating on the question, Dog + Sun + Clover. What does this mean? Hi Mona – How would you interpret your 3 card spread using the instructions in this article? Hi.. My question… Why I haven’t met my soulmate? I have … Bouquet, dog, rider. Dog.. This is someone that I know. Bouquet.. A charming person. Rider..he also have an outgoing personality. Bouquets, rider… I will receive happy news from him. Dog, rider… It’s a possibility that he will visit me. I’m new to the lenormand. I hope I got close in explaining what the cards are trying to tell me. What do you think? Good job Lizzie! Did you figure out who he is based on what the cards told you? If not, you may want to look at other meanings for the cards to see if they give you any additional insight into who he may be. You can find a list of meanings here: Lenormand Card Meanings. Hi , I just want to thank you in creating this Lenormand website. I come frequently here to read the meanings of the cards when I’m confused with a reading that I’m doing for myself or friends. I tried to learn the Tarot, I still find it hard to understand, even if I know the meaning of the cards. The Lenormand is much easier for me to understand. They get challenging at times, but at least their messages are more clear to me to get then the Tarot. Also.. I didn’t know that I could mirror the cards in a 3 card spread layout, and I didn’t know I could start my reading by reading the cards individually, then reading them all together. I really like the way you did the reading on a 3 card spread and how much information you got out of it. Will you do a 5 card spread layout in the near future? I appreciate all the work you’re doing here. Thanks! Hi Lizzie – I’m so glad my site has helped you! I understand what you mean about Tarot. Lenormand came to me much more easily and more quickly. I can certainly do a 5-card spread layout in the future. Thanks for suggesting it! The Bouquet… Tells me he have dark hair, he’s a handsome men. The Dog… That we are just friends, and he told me once that he is loyal when in a relationship. The Rider.. Well, he’s been coming and going, and he stayed with me for a short period of times, we are both in the forties, but he’s younger than me, he second job he’s a referee, so I can say he’s an athlete. This is great Anne! I didn’t expect this 3 card to tell me so much about my soulmate. Thank you for pushing me in to getting more information with my spread. Great… Thanks! Woohoo! Great job going beyond your comfort zone! I don’t read the Fish card as soulmate. I’m not sure where you’re getting this meaning from. It can show a deep connection, but it doesn’t mean soulmate. If you want to use the Fish card as meaning soulmate, you can – try it and see how it works for you. Let the month play out and see if the Fish card works as meaning soulmate for you. Yes, I mixed up the soul connection with soulmate. So I asked a general question, tell me something about today? I got clover, mice and sun. Here we have 2 positives with the central card being negative. Do I presume that I will have a successfully anxious filled day? Or I will successfully lose or got something stolen something today? Also, with mirroring the first and last cards it deems major success, but because of the middle card it means successful loss of some sort. Is this correct? I am curious because I might think the 2 positives would trump the negative but since the negative is the central card, the two positives reinforce that negative. For daily spreads, the most simple, least significant interpretation is usually the correct one. The cards generally take on very minor meanings. Hi Dawnne – Using the tips above, how would you interpret your spread? Trying to follow the rules of reading from left to right, I am taking the cross as what has happened or is happening now, sorrow, hopelessness, suffering-a bad situation, breakup, etc. The sun means happiness, a positive outcome, etc., and the house means security and family. We aren’t speaking. It is a very bad and complicated problem with others involved-not any other love interests, however. A lot of people don’t understand the whole thing it is so confusing, and I have gotten conflicting readings with tarot. Please read the instructions again. All 3 of the cards are answering your question. You’ve listed their meanings. What about the other steps in the article? How would you combine them? What emphasis is the central card giving? Forget about your current situation and focus on the answer the cards are giving. It’s pretty clear once you take your emotions out of the reading. Thank you for your help. I did re-read it twice just now. I hope I have this right. If not, I give up.I used the meanings of each in trying to put this together. I don’t know what else to make of it, and am trying very hard-I don’t see what the cards are trying to say as you can. Reading from left to right and using the sun as the central card, the sun isn’t shining and has disappeared from the sky. There is no more light, and the emphasis with this card is on putting an end to looking at everything in the context that the sun will come back. The cross being about sorrow and destruction is not about what has happened, as you said, it is about what will happen or is happening, and this goes along with the sun shining being an illusion and a lie. The house is being affected by the cross, which is or will destroy it since it is not stable, and the sun’s only purpose in the reading would be as it fades from the sky to set fire to the house while it has any power left. The sorrow and pain is so strong that it causes complete destruction of everything in its path. Hi Dawnne – The Sun is one of the most positive cards in the deck. As you wrote before, it means “happiness, a positive outcome, etc.” Why have you changed the meaning? The Snake and Fox are the cards that refer to illusions and lies, but they aren’t in your spread. I think you’re trying to interpret the cards like Tarot. The images don’t matter in Lenormand. Otherwise, I’m not sure how you came up with “the sun isn’t shining and has disappeared from the sky.” Just look at the meanings. The Sun is the central card. What does it mean? Forget about what the art looks like on your card. Lenormand vs Tarot: What’s the Difference? I read both of the articles that you posted for me. I was trying to put too much together, maybe that was due to tarot like you said? I was able to understand rider+bouquet, and vice versa fine. Ring and key also. They make sense. But trying to use noun+adjective in my case, it comes out like an oxymoron-sorrow and happiness-like something from Shakespeare, e.g., darkest day. So individually for me they make no sense, hence what I came up with before about a dark sun.. Looking at your combinations, I see that it means an improvement in a bad situation, relief, so I will use that. With the sun+house, if I am supposed to do that, it means happy home, happy family. How do these tie together? I don’t understand. If the first part is relief, as something is over, where does happiness come in with house? This seems to be two contradictory things also, unless the house then will be occupied by other people who will be happy there. Lenormand is very blunt and to the point. Take the cards at face value. There isn’t anything about other people occupying the house. There aren’t any cards relating to people moving, buying/purchasing a house, or anything about a change of residence. Look at the cards in light of your question. You asked about what would happen between you and your ex this year. When you look at the cards based on the question you asked, what do they tell you about you and your ex? Hi Anne. Again, thank you for your help. I guess I’m getting confused now with combinations, with the cross+sun meaning relief or improvement, since I really can’t figure out separately how to take them at face value, with sorrow and happiness being the opposite of each other. I have to thank you so much for the combinations, they are wonderful! Now trying to put house together with relief from the combination of cross+sun, taking all of the other possibilities of newcomers to the house out of the equation, and trying to put this in context of my ex, since the sorrow of the cross will be relieved or improved with the sun and since he basically abandoned the house last June for three months, he told me to get out in that time, I had to find homes for all of the geese, ducks and chickens there were, left like they were nothing, and they were all his, he has only been back to the house a number of times countable on fingers, when t comes down to it could care less what happens to it, I am now taking it that the house’s future is unknown, the card just shows a house at face value, not what happens to it. But the happy home part from the sun+house when you combine it with relief or improvement means that relief will come since the house is just a house at face value, and I will one day be happy knowing I don’t live there, unlike how I feel now and happy to think that one day a happy family may live there, but as it is, it is just a house, looking at the card alone, which is what is was for him. So he is happy he doesn’t live there anymore but has a happy home life living either with his parents (dysfunctional for neglect and emotional abuse to him and siblings) or in the basement of one of two rental properties they own. I wish there was a way to mirror the sorrow, reading the cards, to come back to him for everything he did. I was really trying to read as much as I could about mirroring to try to figure this out, as to how could someone do all of these things and have no regrets in ditching me and everything else as he says he does. I hope I did better with it this time. I sure hope so. Hi Dawnne – I’m glad you like the combinations. I think part of the problem you’re having with the reading is you’re trying to figure out the how based on the past. You’re asking the cards what will happen. They are telling you what will happen. They don’t care about what has happened in the past between the two of you. The cards are answering only your question of what will happen between the two of you. If you want to know about moving, you need to do another spread asking about moving. If you want to know if something will happen to him for doing what he did, you need to do another spread asking that. You only asked what will happen between the two of you this year. The cards will only tell you what will happen between the two of you this year. If you want to know more, you need to ask more. Someone tried to do a reading for me who is learning to be a professional reader. She is a medium. On basically the same question, I think she reworded it a little better, this is what she came up with. She used more cards but she has quite a bit of experience, far from expert, but I have none. She said this was a very good reading and provided details, such as I would have all my dreams come true and be on top of the world. I don’t see how, and didn’t understand a lot of the explanation. I told her a good bit of the story of what had happened also from beginning to end which actually might be a candidate for Ripley’s Believe It Or Not. What deck did she use? Just curious since Lenormand only has 36 cards. She used Instant Lenormand by Lyn. Does that make the reading bad? I have no idea. I think I am going to leave the reading I did alone because I can’t figure it out. I honestly don’t know what I am doing. The lady who did the reading for me came up with the question of what would happen in the personal relationship between us in 2015. I asked similar when I did the practice reading but she came up with the question based on the information I provided her. I guess me asking the question wasn’t a good idea since I can’t even interpret the answer. It doesn’t make it bad. It just isn’t a normal Lenormand reading. Lenormand only has 36 cards. The reading you described references card #38 money. There isn’t a card 38 money in Lenormand. Thank you for your help. Now I know about the number of cards in a deck. Can it be told if it is a positive reading from this even though the cards are more? Is it better than I have been doing? Like I said, it isn’t a Lenormand reading. It uses cards that are not a part of Lenormand. My advice would be to see how things play out to see if your friend’s reading is accurate. Thank you for telling me that it wasn’t a real Lenormand reading that she did for me, and pointing out a liar. I had no idea. I was mad since I thought it was a real reading, and I really need the guidance. Something. Anything. I feel like I was made a joke of and betrayed, as if the circumstances involving the question I asked weren’t bad enough. I think I pretty much lost a friend by telling her all that. She says that with the 72-card deck she can use multiple cards and use alternates. She also pointed out that Money was the only non-traditionaI card to come through, and had a purpose. I know that she did not charge, she is a medium who is becoming a reader, has experience reading, but a lie is a lie, it wasn’t Lenormand and she says it is, and I told her that she should do research on a reputable site like this one before she tells people things she knows nothing about. I wasn’t even able to interpret a three-card reading for myself, so that seems to be a dead end. I wish there was a Lenormand site like there is for Tarot with Biddy Tarot where you can have actual former Biddy students who completed the entire program of study offered by them to do readings for free to help them get started. I haven’t seen anything. I don’t have any money with everything that has happened and I really would like a true reading, finding out Lenormand makes more sense than Tarot to many people. Have just discovered your website and I’m really finding it useful – thank you. I have a 3-card spread that I would like to have your opinion on. I asked if I would be engaged soon? I got from left to right Crossroads (22), Moon (32) and Heart (24). Having the Moon as the central card representing recognition and falling in love I would take that as a positive sign (maybe even within a month!). The Moon-Heart combination suggests a passionate romance (your interpretation) however the Moon-Crossroads suggests lack of commitment and the mirroring from the Crossroads and Heart even suggests an affair 🙁 My intuition (Moon) tells me that perhaps the confusion is about when to propose rather than who to propose to… Haha! Would drawing another card be useful or am I missing something? Hello! First of all, I must say Cafe Lenormand has been helping me a lot! I started studying Lenormand a few months ago and the Lenormand Card Meaning link is really great! Thank U! I asked Why havent I met my soulmate and I got Ship-Heart-Paths. Does it show that I havent met him because he is a foreigner and that he is not ready to settle down? Heart + crossroads is not an easy combination for me… Does it make any sense? Greetings from Brazil! Hi! I recently discovered Lenormand and wanted a second opinion. The other day I applied for a job at a college I have been wanting to work at for a long time. (I have applied on several occasions for different positions but never got called despite being qualified; this particular position, however, is a very low-level one where I could get my foot in the door.) I asked about my prospects with that job, and got Sun + Child + Stars. Am I correct to see this as an excellent sign, with the Child card signifying me working with young people/students? I also should mention that I hope to take advantage of discounted tuition down the line for my own child, who hopes to attend there. What do you think? Thank you!